A wonderful opportunity to work with Di Hope, one of Scotland’s best known painters and teachers. This workshop offers an imaginative exploration of the painted landscape as a personal space. Participants will base their work on their own sketchbooks, drawings and photographs to help them towards a work which explores colour, atmosphere, the elusive ‘sense of place’ and memory. Words may also be involved, in the form of poetry or prose. The day will begin with small, experimental drawings in various mediums to work up the pace, composition and to explore ideas before embarking on larger final works. There will be opportunities to explore monoprinting, acrylics, charcoal and pastels. Di shows her work regularly across Scotland and further afield. 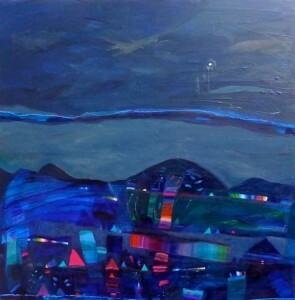 She trained at Edinburgh College of Art, and is represented by The Open Eye Gallery.